L-Methionine is classified as an essential amino acid, which means that it cannot be manufactured by the body. It must be obtained through the diet or by supplementation. 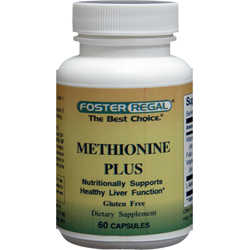 Methionine is thought to keep fat from building up in the liver, and it is often included in liver-detoxifying products called liptropic combinations. These formulations are believed to accelerate the flow of bile and cell-damaging toxins away from the liver. Together with cysteine, methionine is one of two sulfur-containing proteinogenic amino acids. Its derivative S-adenosyl methionine (SAM) serves as a methyl donor. Methionine is an intermediate in the biosynthesis of cysteine, carnitine, taurine, lecithin, phosphatidylcholine, and other phospholipids. Improper conversion of methionine can lead to atherosclerosis. Directions: As a dietary supplement, take 1 capsule two times daily with meals.